The chairman of the Senate Intelligence Committee said its Russia investigation has found no proof that President Donald Trump’s presidential campaign colluded with Moscow, an assertion that congressional sources said puts him at odds with Democrats on the largely bipartisan panel. “If we write a report based upon the facts that we have, then we don’t have anything that would suggest there was collusion by the Trump campaign and Russia,” Republican Richard Burr told CBS News in an interview published on Thursday. Burr said the committee, which has been investigating alleged interference in the 2016 election for two years, has not begun drafting its final report. He also could not say how much of it ultimately would be declassified, according to CBS. 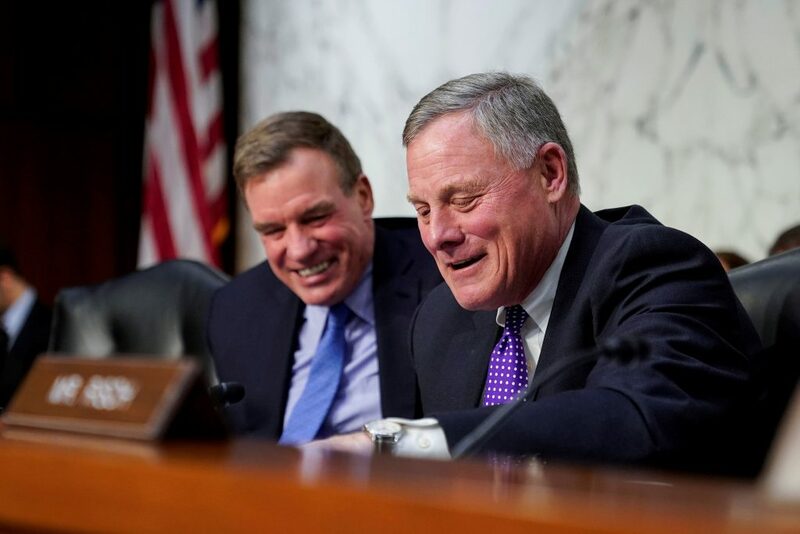 While there has been extensive bipartisan cooperation on the Senate panel, including between Burr and ranking Democrat Mark Warner, Democrats seriously disagree with Burr on evidence of collusion, according to congressional sources familiar with internal committee discussions. A spokesperson for Warner said he had no comment on the CBS report. The Senate Intelligence Committee is among several congressional panels investigating Russian interference and the potential collusion with Trump’s 2016 campaign, along with the U.S. Special Counsel’s Office under the Department of Justice. Trump, saying he is a victim of “presidential harassment,” has repeatedly blasted the federal investigation being led by Special Counsel Robert Mueller as a “witch hunt” while denying collusion. Moscow also has denied interference in the U.S. political system, counter to U.S. intelligence agency conclusions that it sought to sway the election in favor of Trump and undermine Democratic rival Hillary Clinton. Burr’s panel also is examining whether former President Barack Obama did enough to follow up on official government reporting of Russian election interference, as well as the U.S. intelligence community’s January 2017 assessment of Russia’s role in election, in the impact of social media and in election security. Members of the panel are in sync on those topics but differ on the collusion issue, the congressional sources said, adding that Democrats likely would write their own counterreport if Republicans produce a report saying there was no collusion. Burr told CBS that despite media reports regarding a number of interactions between Trump and his associates and Russia, he was “unpersuaded” that they could be called collusion given the panel’s findings. He said it was difficult to ascertain people’s motives. Burr did not say when his panel’s work would wrap up. Other congressional committees have ramped up their oversight with Democrats in the House of Representatives vowing to take a closer look at the Trump administration and the president’s other dealings. Republicans chair the committees in the Senate, where they have a majority, while panels in the House are led by Democrats, who won a majority in that chamber in the November election. Trump, in his State of the Union address on Tuesday, called investigations into him and his administration “ridiculous” and told lawmakers their probes would stall legislative efforts and, without offering evidence, endanger the nation’s economy. Despite the warning, House Intelligence Committee Chairman Adam Schiff on Wednesday vowed to pursue a wide investigation into attempts to influence the 2016 election that included looking at Trump’s financial transactions. A House tax-oversight subcommittee will hold a hearing on presidential tax returns on Thursday. Trump bucked tradition during his 2016 campaign by refusing to disclose his returns, which could shed light on his finances.